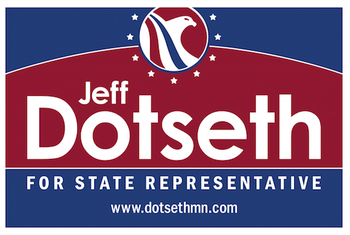 The mid-term election is at hand - With that said, I ask humbly that you review my positions and understand why I am the best choice to represent you in the House Seat. It's our hard-earned money. Reducing government spending and increasing your pay will stimulate economic growth in our district. Minnesota's tax burden is too high -- we're the 4th highest taxed state in the nation, and our lowest tax rate is higher than most states' highest tax rate. Reducing and simplifying taxes will keep more money in your pocket and make Minnesota more competitive. Jeff will support efforts to reduce the size of government so we can lower our tax rates. Jeff will fight to lower property taxes, and rather than picking winners and losers with corporate subsidies, focus on making Minnesota more friendly for business so businesses of all sizes and relocate and thrive here. Jeff supports improving our business climate so we can grow good-paying jobs. He also recognizes the importance of unions and labor groups to ensure safe working conditions, good benefits, and good wages for hardworking Minnesotans. Making Minnesota a better place to do business will grow small business jobs and improve opportunities in our district. Small businesses can thrive here if we reduce the red tape and excessive regulations that drive up costs. Health care costs continue to rise for too many families. Government involvement has unfortunately only made the problem worse. MNsure failed to deliver the promises made by the politicians who brought it here. Jeff will work to improve competition in the market and drive down costs. He supports cutting the tax on health plans that pays for the MNsure website, and other efforts to expand health care choices and improve health care price transparency. Jeff will support the rights of law-abiding gun owners and oppose bills that only would take guns out of the hands of law-abiding gun owners but do nothing to stop the criminals that don't follow the law to begin with. We must protect innocent life. As a moral issue, we clearly must protect the life of the unborn. I am Pro-Life. The sanctity of human life is from conception to natural death. Jeff knows that parents and local school districts are the best decision-makers about what's best to ensure a good education. Jeff will oppose new state mandates on schools and teachers, promote education options that empowers parents to choose what's best for their kids, and make sure we're doing everything we can to fix schools that are failing. We need to keep the promises we've made to our veterans. They've sacrificed so much to give us our freedoms, and it's only right that they receive top-notch care and services in a timely manner. Jeff will fight for our veterans and ensure the state is doing right by those who fought for us.